I moved to Eugene in November 2005. After several years without riding, in March of 2006 I once again acquired a motorcycle. It was a BMW Dakar and with it I started riding again. 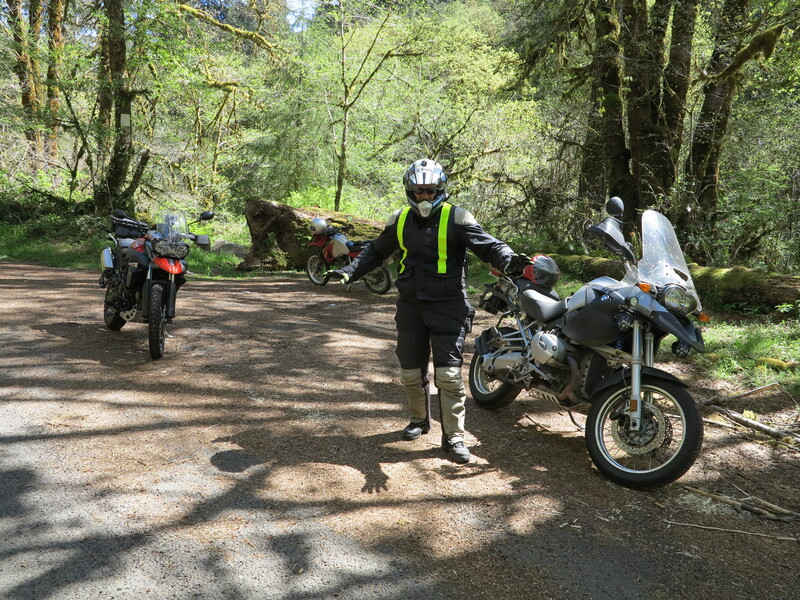 New to the area, riding was a way for me learn about this beautiful state and it expanded my social network. I met local riders and great friendships evolved from there. 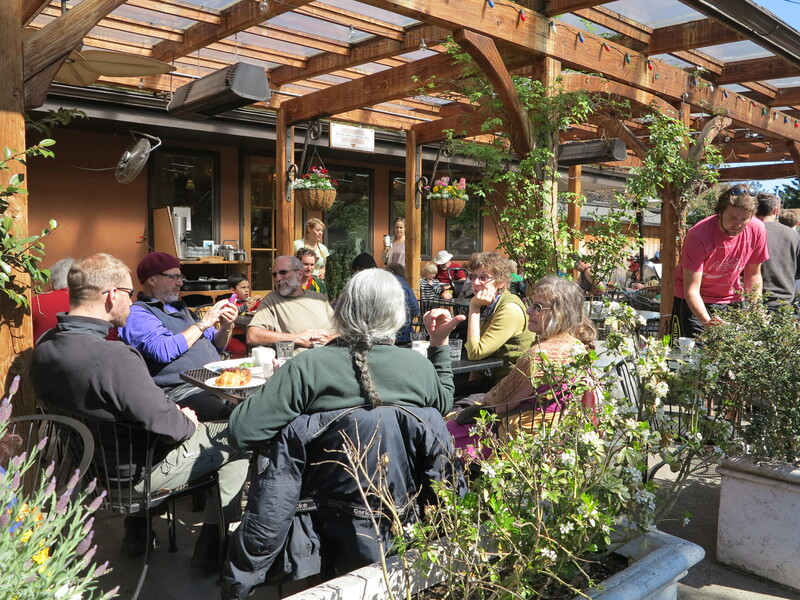 Back to a few weekends ago, Sunday April 13th was a sunny day, and just before 9am I got a text from Doug confirming a ride we had talked about the evening before: “we’ll meet at 10:00am at the Hideaway Bakery” the text said. It was going to be a group of people, some of them it has been a couple of years since the last time we rode together. I was looking forward to this ride. 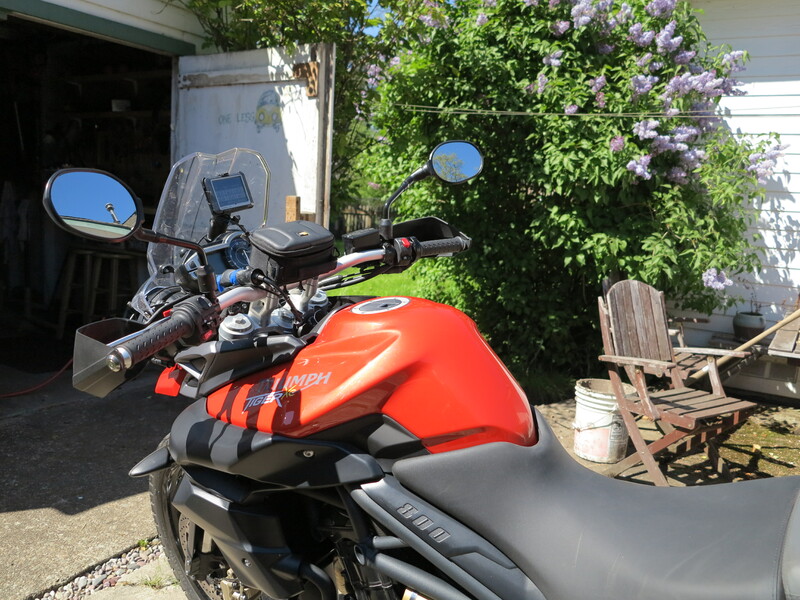 I got the Tiger ready for the job, “it will be a relaxed ride”, I told myself, “with a possible gravel excursion”, I projected, “the Tiger is the best bike for the job”, I concluded. 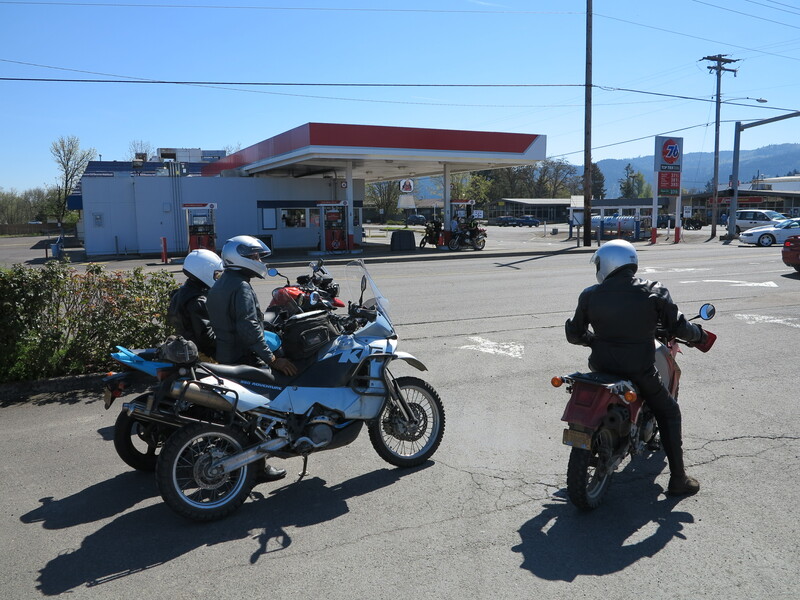 I went to the usual non-ethanol gas station on the corner of Hwy 99 and Irving Rd to top the tank off. 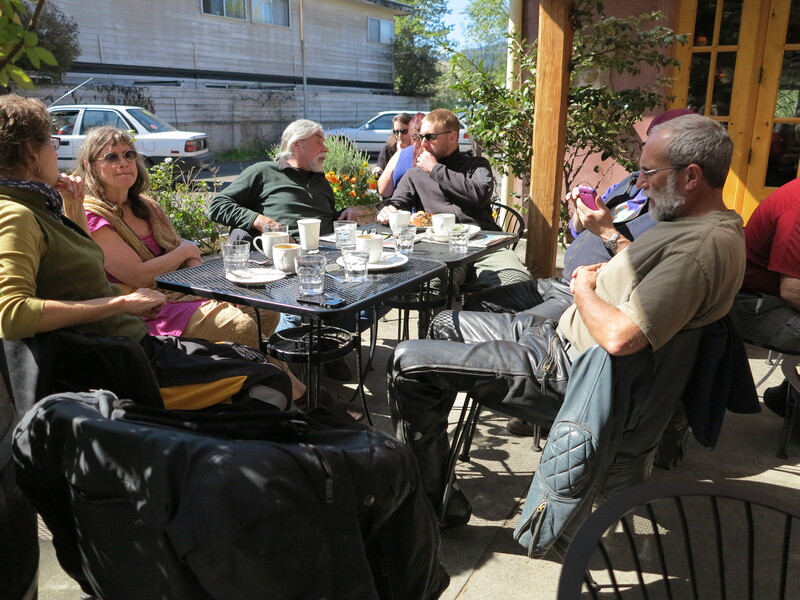 From there I got on Hwy 99 east to meet those guys at the Hideaway Bakery, on East Amazon. When I was about to reach the corner of 99 and Roosevelt the light turned to red. On the right sidewalk a lady in a white dress had probably pressed the pedestrian button, she started her way across 99. And right there I witnessed an accident, just as I was waiting for the light to turn green. It was something that could had been a lot more tragic then it ended up being. A dump truck filled with gravel was coming down the bridge (bridge over the train tracks) on 99, opposite from the direction I was coming from. I’m stopped at the light on the first row, so I have a great view of the road ahead and spotted the truck coming down 99, in which appeared to me to be higher speed than normal, considering there was a red light and cars were stopped on the corner with Roosevelt. So I paid close attention to the truck. The driver gets on the turn-right-only lane to Roosevelt, where there were no cars stopped waiting to turn right, it is a 90 degrees turn, if not less. With that speed now I knew the truck was not going to make it. 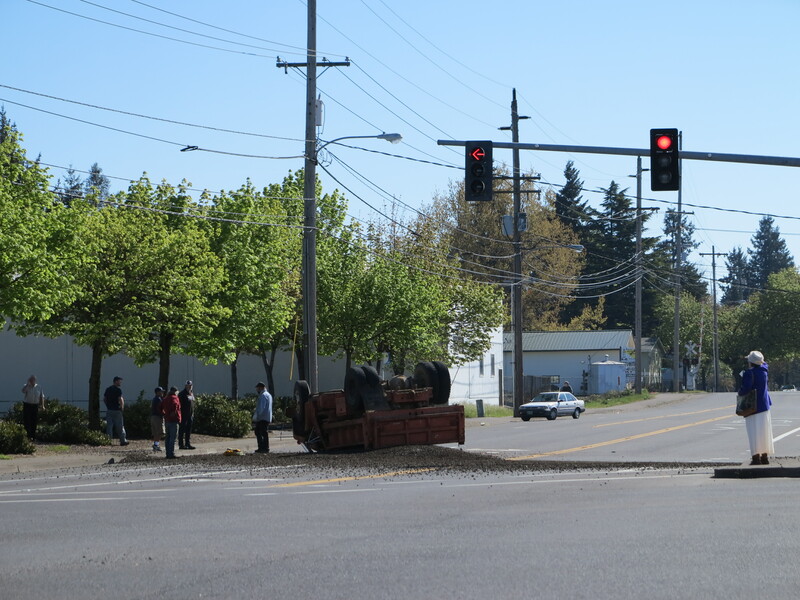 The truck started the turn, its bed started flexing, then the truck was on two wheels, then the truck was upside down and stopped, on the middle of Roosevelt Road, wheels up, motor over-revving and spewing black smoke before expiring. All of this happened in about 5 seconds from the time I spotted the truck, to the time it was upside down. But I remember the accident as if it were in slow motion. Luckily all of this happened before the lady in the white dress had reached that very lane as she was crossing 99 towards that direction! 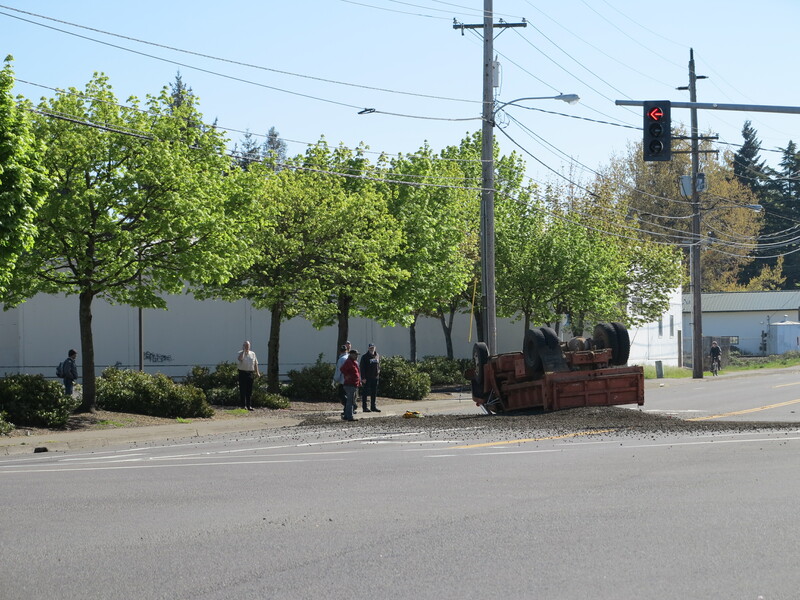 Dump truck over-turned on the corner of Roosevelt and Hwy 99. Roosevelt is straight ahead, 99 goes left to right on this photo. By the time it was all done and dust had settled, the light turned green for me so I moved my bike to the other side of Roosevelt from where I took these photos. Luckily for the driver, he did not hit anyone or any car. See the lady with the white dress in the middle of the island? As I mentioned before, she was just about to cross the last portion of 99, exactly where the truck went by on two wheels, on a red light for him, green light for her. As if coming out of nowhere, three guys rushed to the scene and arrived at the truck’s cab just about the same time to rescue the driver who was trapped inside the truck. In seconds they had the driver out, who walked away, apparently unscathed, and before I could get the bike to the other side. It was all that quick. One of our traits is to help out our brothers. The lady in the white dress can only be thankful for the circumstances. You can see the trail of spilled gravel starting on the sidewalk, by her right foot. 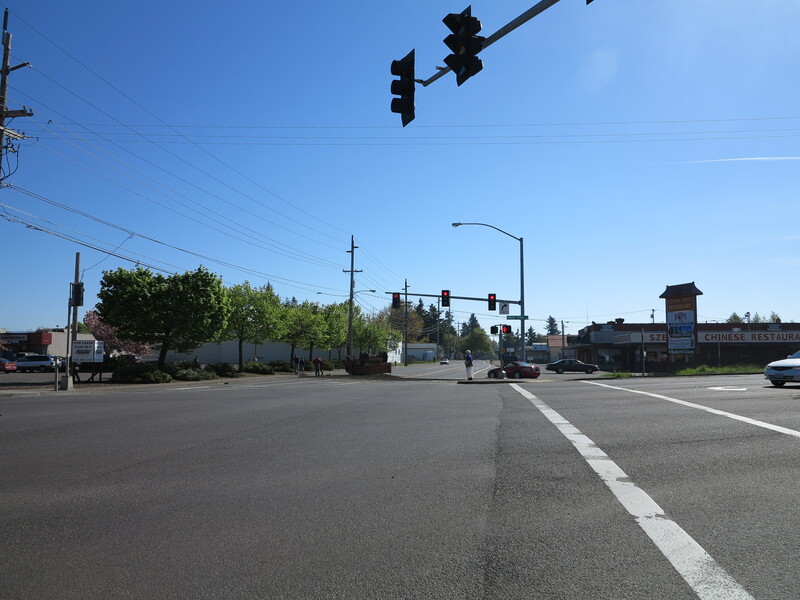 It was spilled when the truck drove on two wheels trying to make the 90 degrees curve to enter Roosevelt, right in front of her, right where in a few seconds more she would have stepped on the road to cross the last portion of Hwy 99. The guy with the white shirt under a tree towards the left, on the picture above, is probably making the 911 call, the driver seems OK, the situation appears under control, there is nothing I could do to assist anyone on the scene. I got back on the bike and continued on 99 towards 7th Ave and from there to Pearl St to get to my meeting with the gang. My speculation is that the truck’s brakes failed, as the driver obviously was not able to slow down, and turning on Roosevelt was his way to avoid hitting the cars stopped at the red light. Turning there would probably work also to perhaps scrape some speed and maybe save the situation completely if he had made the corner. Luckily a bigger tragedy did not materialize. There were no cars and no one on the way, the truck’s path was clear. As I left the scene, the lady on the white dress was still there, standing on the same spot, staring at the over-turned truck as if she were frozen. I can’t imagine her thoughts and sentiments from being so close to becoming a fatal victim of this accident. What if she had eye contact with the driver in the couple of seconds he drove by her on two wheels, not more than 3 feet away from her, and spilling gravel over her feet. If so, driver and lady probably both know what each other went through in that momentary lapse of time. I got to the Hideaway Bakery with these thoughts meandering about in my mind. I’m not one to take anything for granted and things like these only augment my perspective on life. I was more than ever looking forward to a relaxed riding pace. Which was not to be, later I would find out. But let’s go one step at a time. My friends were peacefully and joyfully having breakfast, sitting outside, it was one of those days that give you an idea about what summer feels like. They had a cup of coffee the way I like and a scone waiting for me: have I told you how nice these guys are? I parked my bike and joined the crowd. Kyle was not there yet, he was coming from Corvallis, where he works at the Del Alma restaurant (Side note: we went there last Thursday, very interesting Latin-European fusion cuisine, I enjoyed the leg of lamb on a bed of soft polenta). left to right, and clockwise: Kyle, Lew, Doug, Annie, Janet, and Ken. I met these guys several years back. I met Doug and Kyle in 2008 at a BMW Discovery Rally, and through them I met Annie, then Ken. There are others missing here, but this is, give or take, a core group. I’m very respectful of these guys, even if by now I’ve ridden for many years with them, I’m still the new guy of the bunch. Exponents on this group, on the fast side of riding there is Lew. He is not a frequent rider with this group, although they have a riding history with him. I had never ridden with him before, but his fame preceded him — whenever people talked about him it was to describe how fast and intense his riding is. Enjoying a sunny Sunday – all Sundays should be sunny, it is in the name. Or every sunny day should be a Sunday. Another exponent on this group is Kyle, the youngest of the crowd. He rides like a motorcycle riding textbook should read: his riding is impeccable, his reading of curves as shown by his speed, approach, turn in, and perfect arching line towards the apex is spot on time after time. Very consistent, he is smooth and fast. 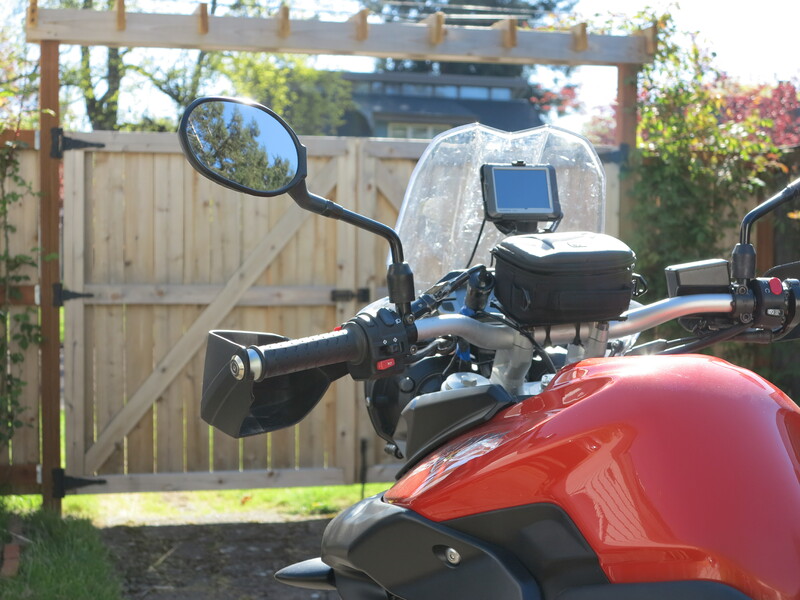 He always keeps a reserve spot for emergencies on his riding – that is, never to the limit. He is someone good to follow and to use for pace. It is a lesson in riding each time I follow him. After we got done with eating and talking, it was time to get up and ride. I went to the restroom and when I was back outside they were huddled around the bikes, making decisions about where to go. I was only going to follow, had a full tank of gas, I did not bother knowing where were going. It was all about enjoying the ride and trusting they were making a good decision. Janet was driving so she went home from there. Motors coming to life, Lew went first, followed by Ken, and I followed the two of them. Behind me Annie, then Doug. Kyle was last. We took off on Dillard Rd towards Hwy 99. Lew disappeared ahead, and I kept up with Ken and we opened up a gap to Annie and the others. Then Ken slowed down, played with the fuel petcock on his bike and stopped at the intersection with 99 to let us know he was running out of gas. Lew waited up ahead on the road, he was already on 99 for a while. And that became the theme for this ride: Lew would jump ahead, then would wait at some place until others would catch up. We stopped for gas in Cottage Grove and from there we took one of Doug’s favorite roads, the Cottage-Grove to Lorraine Highway. Lew took off again, and this time I followed him. It was obvious I was not going to keep up with his speed, and I did not bother. But then I looked in the mirror and Doug has caught up with me, I wave him past me. There is something animal in all of us, in the wild sense of the word, and it comes out one way or another. Well… we are animals! Somewhere in our DNA there are genes from days when we depended on excellent hunting skills, not unlike other top of the chain animals, which were key to our survival at some point. The inherent capacity to observe movement from the corner of our eyes is one of them and the chase instinct is another one of these true animal instincts that are very much still intact in our being today. Although we use these instincts most for sports today, it is proof that we were and we still are hunters if not also gatherers. Back to the story, as soon as Doug went past by me a chase started. That’s where my relaxing ride ended, and a more primitive kind of fun ensued. Doug was chasing Lew, and it contaminated me, after all, we are the kind of predators who hunted in packs. Soon we hit the small pass and the tight curves started Doug got more distance from me, although he could not totally disappear from my view. I could see him when the road would open on longer sweepers. And once we started the way down on the other side, every now and then I could still see Lew way ahead, then Doug. Lew was on a KLR. Doug was on his KTM Adventure 950, and I’m in my Tiger 800XC. The 800 triple was at various times on the 7-8,000 RPM territory, on 2nd and 3rd gear. The bike has a close-ratio gear box, so changing gear at higher RPM sounds like you never moved up to the next gear — let’s say a change at 9,000 RPM and the motor comes back screaming at 7,000 RPM on the next gear up and soon it needs a new up change again. In theory and in practice I had the best bike for these roads among these three guys. But I could not keep up with them. Rider skill, “cullones”, or degree of sanity (or lack of sanity), prevailed. As the tight curves ended and the road regained more sets of sweeping curves and finally straightened up closer to Lorraine I got close to Doug and Lew. We stopped in Lorraine and soon the rest of the group caught up with us. Ken was complaining the tires on his legendary Bumble-Bee R100GS were past their prime, Ken was done for the day. We had plans for dinner later at Doug and Annie’s house that evening and they had to set things up, so from there Doug, Annie and Ken took off towards Eugene. Lew, Kyle and I would continue on Wolf Creek Rd. We said our goodbyes and Lew took off at speed yet again, Kyle looked at me waiting whether I wanted to go after Lew, but I declined. I used Kyle as my pace setter. 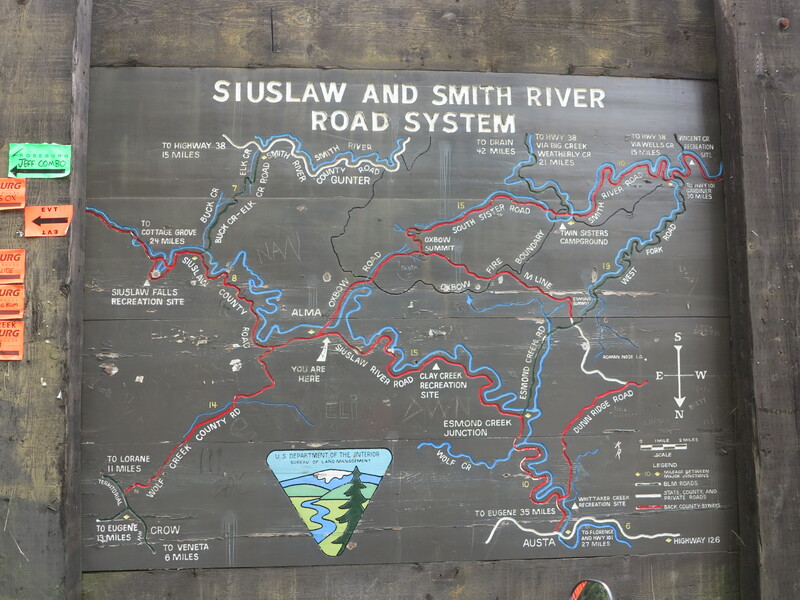 We kept up with Lew until we reached the single lane Siuslaw River Rd. From there Kyle slowed down, and I just settled down as well, following Kyle and enjoying a riding lesson. We regained sanity and enjoyed the ride at a spirited but much safer pace. Lew waited for us at the intersections and we went this way towards Whitaker Creek rd, where we made a pit stop before getting on 126. From 126 we made a left on Poodle Creek road, to Sheffler, to Buttler, to Territorial, to Clear Lake Rd. From there Lew went his own way, towards somewhere around Junction City, I believe. And from there I went to my house, Kyle followed me there before going to Doug’s house. 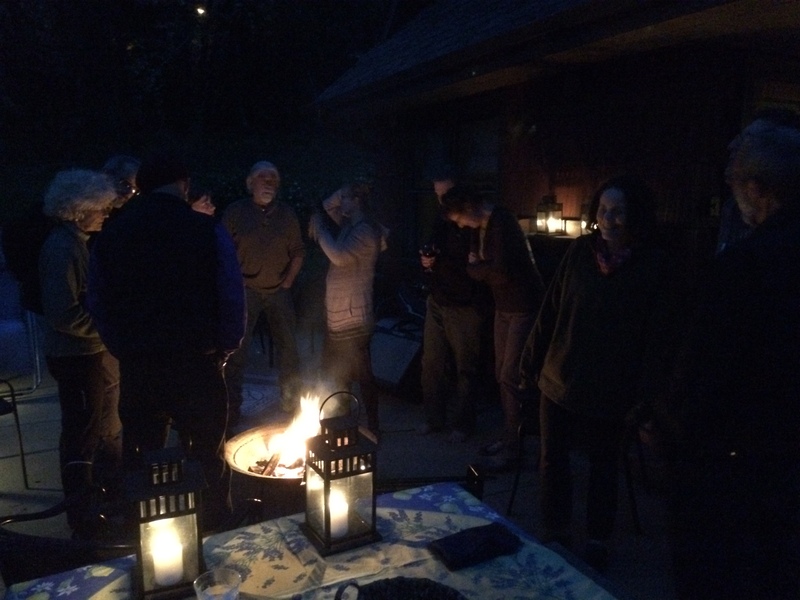 Over dinner we all regrouped, others who did not go for the ride joined as well and tall stories followed around the pit fire. By this time the morning accident I had witnessed was forgotten. 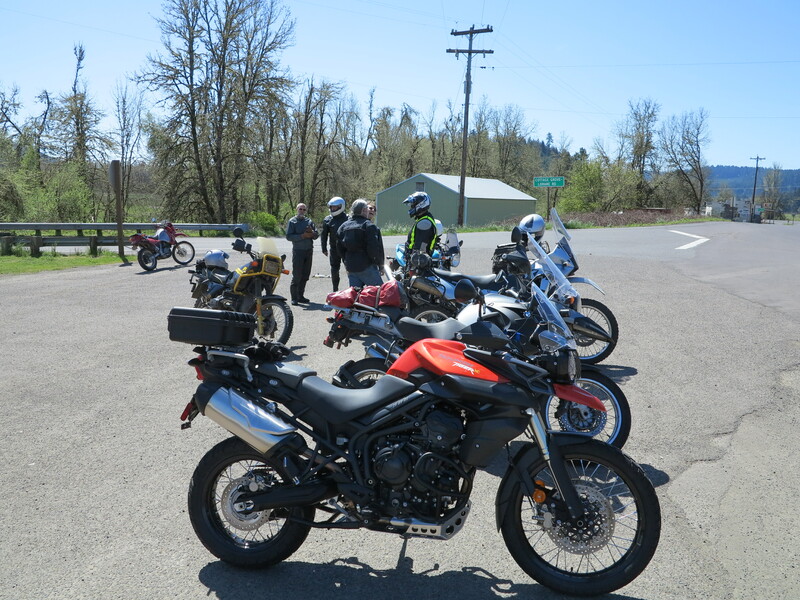 It turned out to be a perfect day for riding, it was great to had it started with breakfast and end with dinner. We were all there, safe and sound. I confess I was riding faster than I had planned to ride at the beginning of the day, but I never got on a “oh sh!t” moment, never crossed any double yellow line, never hit the rev-limiter on the bike. I can say I kept it sufficiently sane, which is how I like it. On the other hand, I don’t think I’ve ever pushed this bike this fast before. At times I wished I was riding the Ducati, but most of the time I was happy I took the Tiger instead. The Ducati would be too much of an unfair advantage for one thing, but for another, it would get rid of any resemblance of excuse I could still have for not keeping up with them. The Tiger already offered no excuses as it were. The Tiger is back home safe and sound, after a nice bonding experience! In the end, looking in perspective, taking the Tiger for this spin was a great decision. Pushing it to its higher notes was a great bonding experience with this bike. This bike still retains some of the most fundamental analog functions that make what I now call a neo-classic motorcycle, a dying breed. That is, besides ABS and fuel injection it does not have the other features most top end motorcycles today have like traction control, riding modes, and electronically actuated suspension systems. 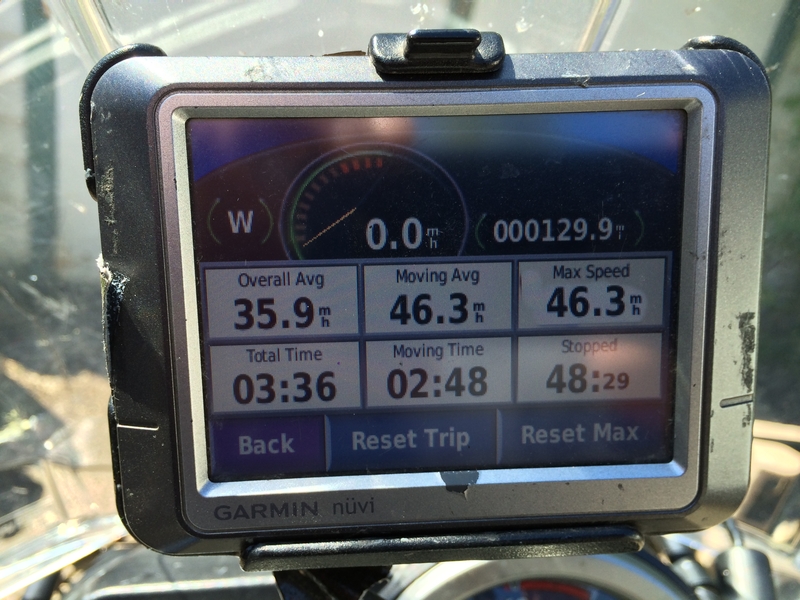 Although I like these features, it is nice to have a motorcycle that still keeps you somewhat honest. I will be riding more of this bike. This entry was posted in Riding the Triumph, The Book. Bookmark the permalink. Thanks as always, Bob, for your caring words! Well, the truck was actually a few lanes away from me, as I was on the right lane going east/south he was on the right lane going west/north, so I had a few lanes of buffer between the truck and where I was. But still, it was a dangerous situation, especially if he had hit one of the cars stopped at the light on one of the more central lanes, which could had been pushed towards my direction. Hope you are doing fine, Bob! Hi, Cesar – a little correction to the picture of you all at the gas station – that is Creswell your friend got gas in. That’s on the northwest side of the intersection of Goshen-Divide Highway and Oregon Avenue. I know it well! Hope all is good with you. Enjoy your blog every once in a while. Hi Leslie, you are right, it was Creswell!